Nothing makes Us happier than a great pair of leggings and we can always count on Zella to deliver the goods. Nordstrom’s in-house brand has become an Us reader favorite because they are top quality and boast a selection of styles that rival most other brands of leggings. The workout tights are so cute that we have long stopped reserving them for the gym only. Zella leggings are also so comfortable that we feel great wearing them when we are lounging around the house and even on the go. The new leggings we have our eye on from the brand are the Zella Sea Level High Waist Ankle Leggings. 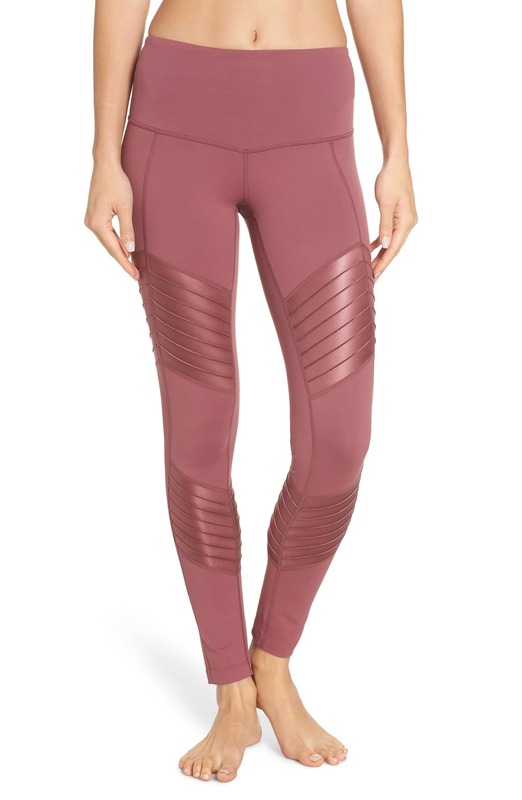 They have an elastic high waist for compression and shaping, a fabric blend that includes nylon and spandex for stretch and moto-inspired panels stylishly placed along the thighs and legs. See it: Scoop up the new Zella Sea Level High Waist Ankle Leggings available at Nordstrom for $75. Looking for an alternate style? Check out the equally chic Zella Shine Zip High Waist Ankle Leggings for $69 and all the stylish Zella Leggings options. The leather-look style details serve up a cool edgy element. The moment we slip into a pair of moto leggings, we are ready to hop on a Harley wearing a matching leather jacket with a red lip and our hair blowing in the wind. Of course, that’s likely all fantasy and we will just be heading out on the town to run errands or hang out with friends, but it is all about that cool girl look! Sizes for the Zella Sea Level High Waist Ankle Leggings range from XXS to XXL. These workout tights are available in two colors which are classic black and Burgundy Rose (pink). While we plan to get the black version since there is obviously no such thing as too many leggings, the Burgundy Rose shade has also totally stolen our hearts. The moto panels in this color have such a pretty metallic finish. Both leggings can be worn with a variety of different sweatshirts, sweaters and sneakers in various colors. When we are just having street style fun, we plan to wear the Burgundy Rose style with a long sleeve white shirt, the fleece Zella Cozy Up Bomber Jacket we’ve also had our eyes on and a pair of Ugg sneaker boots for a look that mixes neutrals with a deeper pink. For an ensemble we can slip into whenever we are on the go and want to look cute with super minimal effort, the plain white hoodie and fresh white sneakers combination is a great go-to for the leggings in either color. Shoppers who dislike the moto style or own enough leggings with that design and want to make a slightly different statement may love the metallic Zella Shine Zip High Waist Ankle Leggings. These workout tights have an eye-catching shine that still manages to be neutral thanks to the Grey Kitten hue. See it: Get these equally chic Zella Shine Zip High Waist Ankle Leggings for $69. Looking for more alternate styles? Check out all the stylish Zella Leggings options. 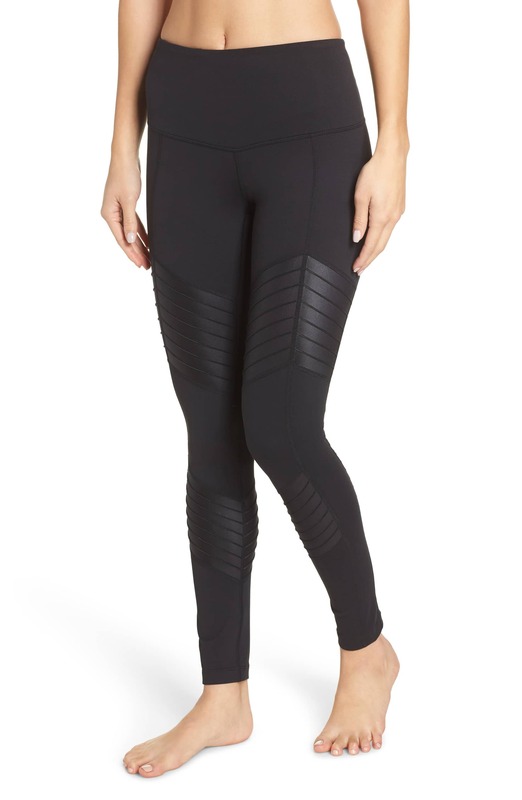 While the moto panels are what make the Sea Level leggings so eye-catching, this design gets its cool factor from the metallic finish and zippered symmetrical inserts along the thighs. The leggings have a smoothing, no-roll high waistband that makes for a comfortable wear experience and moisture-wicking fabric for minimizing sweat while we are on the move. Shoppers who practice yoga or do lots of stretching might also appreciate that detail since it prevents the annoying bump in the back when it is time to do workouts involving floor mats. Another detail we love is that the zippers are not attached just for show; they are actually real pockets! Sizes for these leggings range from XXS to XXL. We can quickly throw on a light grey sweatshirt on top of these leggings and step out in grey sneakers for a sporty monochrome style moment that is still a fun visual. Of course, the white top and fresh white sneakers trick also work for these Shine Zip workout tights. We are adding all three of these great designs to our carts right along with the marked down Zella leggings we recently spotted on sale. Get ready to step up the athleisure game with Us! We are running with the comfy-chic trend all fall and winter long.